WordPress 3.6 (“Oscar”) has been released few days ago. We immediately started to test all our WordPress themes against the latest release of the blogging platform. After testing, we could conclude that all our themes are compatible with this version of WordPress, however, some of them needs small modifications in code. As we announced earlier, all future WordPress themes will be based on Sparky Framework for WordPress. We have already published several themes based on this framework (Blankie, One Page theme and Explorer). 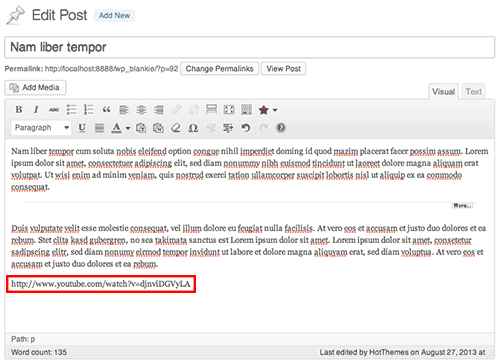 Actually, only these themes can make a slight problem in combination with the latest WordPress 3.6. After you make this change and upload new functions.php file, you will experience no problems when working with WordPress menus and they will work as they should. Since we are talking about WordPress 3.6 here, it’s good to mention that it comes with several significant improvements compared to the previous version. Probably the most useful feature is auto-save while you are working on your pages and posts. If you are, from any reason, enforced to stop working on page’s or post’s content immediately, WordPress will help you a lot and you will lose less of your work than usually (if you lose anything at all). Also, new WordPress makes browsing between the previous revisions of your content easier. Under Publish tab, you will see how many revisions the post had and click on the “browse” link (next to the revisions number) will split the screen in two parts. Using the “time machine” scroll bar above, you can go back in time to see what revisions you made and when you made them. If you enable “Compare any two revisions” checkbox, you will be able to select two points in time and to compare how your post looked, in example, before one week and before two weeks. Could be really useful and, as far as I know, this is unique feature of WordPress! Click on the “Restore This Revision” button will restore the older revision of your post, if you decided it looks better than the current one. 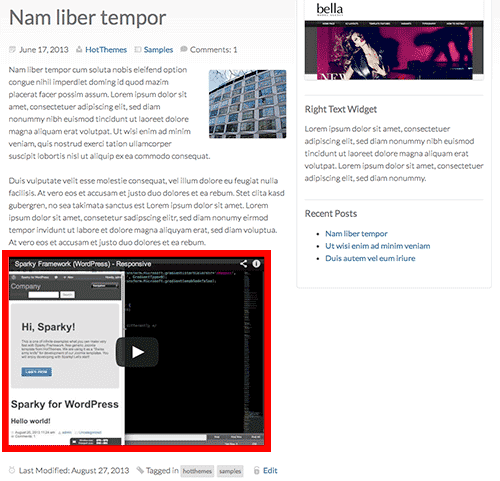 New WordPress also includes a new theme, which is named as it was expected, “Twenty Thirteen”. It’s a very plain WordPress theme. WordPress team highlights the theme is responsive, which once again confirms that responsive behavior of your site is not an option anymore, but it becomes a crucial feature. For the end, I will mention one more feature of new WordPress that really impressed me! If you’d like to include YouTube or Vimeo video into your site, you can do it just by pasting the video’s link! Yes, that’s true, no more embedding of iframes or plugins is needed. Just paste the video’s link and the video will appear in the front-end of your site. It’s an outstanding feature which makes WordPress platform even easier to use in websites development!